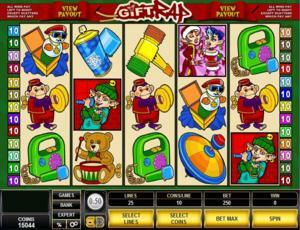 Gift Rap is an online video slot machine game from Microgaming that has been released in December 2005. This video slot game has 5 reels and 25 pay lines. The theme of Gift Rap is all about having a wonderful and happy Christmas season, with lots of Christmas toys to wrap, give, and also receive! Most people say that Christmas is the time for giving and sharing, which is why Microgaming has created this particular Christmas-themed slot game to be a very generous one when it comes to prizes! The Gift Rap online slot game presents players an awesome Gift Grab Bonus Feature game wherein they can win up to 32,250 coins! Microgaming online slot games are available to players in 2 formats – download and no-download. Whether you like to download their software first or you prefer to play instantly without the need to download, then Microgaming surely has online slot machine games to accommodate your every slot gaming preference. Good thing that Gift Rap is available for instant play, so you do not have to download anything to find out if this game interests you in a way that you would like to spend some real money on it. The Gift Rap online slot game is a combination of Christmas gifts and rapping elves, which is why you will surely be entertained for a long time here while playing this game! The Gift Rap online slot game features scatter wins, a wild symbol, a Gift Grab Bonus Feature game, a max coin jackpot of 6,000, a max cash jackpot of $30,000, and it has a high 96.62% payout ratio! The quality of the graphics and sound that Microgaming provides is absolutely remarkable and superb. They have a solid reputation of making the most amazing graphics and realistic theme-related sound effects that will truly transport you to “that specific theme” they used in any of their slot games. Most people love to play games incorporated with Microgaming software because they have smooth animation and engaging yet non-interfering sounds. In Gift Rap, players are transported to the 25th day of December, the exact day for Christmas! The symbols are drawn in a cartoonish way, in bright Christmassy colors, and you will definitely play here for a long time because it will not hurt or strain your eyes. Smooth and simple animated programming is used on the symbols when you successfully hit winning combinations. The overall graphic design of Gift Rap displays everything that can be related to Christmas – Teddy Bears, Toy Hammers, Cymbal-clapping Monkeys, Rapping Elves and many more! The main colors used are red and green, and the other colors are peach, brown, blue, yellow, pink, purple, orange, black and white. The constant background music and sound effects you will hear while playing this game are bells tinkling and a prominent howling sound of the wind. When you spin the reels, jingling bells will be heard. When you form winning combinations, varied celebratory Christmas-themed “rap” music will be played out, depending on the symbols included in your winning combinations. There are no card deck symbols used in the Gift Rap online video slot game. The regular symbols used in the Gift Rap online slot game are the Teddy Bear, Music Box, Spinning Top, Toy Hammer, Cymbal-clapping Monkey, and the rapping elves named Bart, Max, and the two Backup Elves. The Wild Symbol is the Gift Rap Logo. The Gift Rap Logo wild symbol acts as a substitute for all other symbols (except for the Scatter symbol) in order to you help you form winning combinations. You are paid varying prize amounts (refer to the Payout table) when you manage to form a winning combination with multiple Gift Rap Logo wild symbols on an enabled pay line. There are 2 Scatter Symbols in the Gift Rap online slot game: the Rappin Jack Frost and the Snow Spray symbols. The scatter symbols are not required to appear in a line (on an enabled pay line) for you to win. • Snow Spray scatter symbol – Can be found anywhere on the 5 reels. You can complete winning combinations as long as there are 3 or more Snow Spray scatter symbols that come out in an enabled pay line. Your winnings are calculated by multiplying the Snow Spray scatter symbol combination payout (refer to the Payout table) by the total number of coins you’ve bet. Please take note that if you get a scatter win and a regular win, then you are paid out for both of these wins, because the Snow Spray scatter symbol is not required to come out on an enabled pay line for you to win. Scatter awards are independent from pay line awards, and thus they are added to the pay line win. • Rappin Jack Frost scatter symbol – Can be found anywhere on the 5 reels. You can complete winning combinations as long as there are 3 or more Rappin Jack Frost scatter symbols that come out in an enabled pay line. If you manage to get 3 or more Rappin Jack Frost scatter symbols on the 5 reels, you will trigger the Gift Grab Bonus Feature game. Please note that the Rappin Jack Frost scatter symbols will not give out any winnings; however, they allow you to enter and play the Gift Grab Bonus Feature game. Gift Grab Bonus Feature Game – If you get 3 or more Rappin Jack Frost scatter symbols (found scattered anywhere on the 5 reels), you will trigger the Gift Grab Bonus Feature game. In the bonus game, 30 gifts will be presented to you. You are to select Gifts that contain bonus prize amounts, until you get a Rappin Jack Frost symbol which signals the end of the bonus game. When the Gift Grab Bonus Feature game comes to an end, the rest of the gifts are revealed. The random bonus prize amounts shown in the Gift Grab Bonus Feature game are already multiplied by the number of coins you’ve bet per pay line and the number of pay lines that are enabled. You can win up to 32,250 coins in the Gift Grab Bonus Feature game! When the Gift Grab Bonus Feature game is over, you will be taken back to the main Gift Rap online video slot game, and your bonus game winnings are included to your win total. Gift Rap has 5 reels where you may bet on 25 pay lines. The minimum bet is 0.01 and the maximum bet is 1.00 per pay line. You can wager 1 up to 10 coins per pay line bet. Therefore, the maximum bet amount is 250.00 per spin. The maximum payout in the standard Gift Rap online video slot game is 6,000 credits per line bet. People who frequently play online casino games typically love to stay longer on online slot games that have an Autoplay function. Good thing that Gift Rap is equipped with one! In Microgaming online slot games, they have 2 game modes – Regular mode and Expert mode. You can have the game spin automatically for you with the Autoplay function that can be found by clicking the Expert button (if you look closely at the brown line at the bottom part of the game screen, you will see the Expert button just below the Bet Max button). After putting in your preferences, just click on the Start button, and the game will automatically spin for you while you just sit back and enjoy playing this toy-filled Christmas-themed online video slot game!